12 days in to the challenge now and not far from half way. It was that realisation today that had me feeling a little sad and a little anxious rather than relieved. Unpacking that reaction a little further I identified that the list of benefits I was experiencing on the challenge far exceeded any ‘negatives’. In fact, to date I can’t name one serious disadvantage living my new sattvic life. I sleep better, anxiety levels have reduced. I haven’t experienced a ‘food hangover’, felt bloated or overfull; nor have I had any food related cramps. I feel in control of my nutrition choices rather than controlled by unconscious eating and too much food choice. My mood feels steady and I am less likely to react quickly with anger as my first response in some situations (ok, let’s name it – when driving!). My energy levels are more consistent and I don’t struggle post sugar food cravings as I once did. For me these are quite dramatic and noticeable changes. And in only 12 days? Those 12 days have also given me the space and focus (via the challenge journaling) to explore my feelings around eating meat and fish. More on that later. Attached is an easy, no special request required, sattvic lunch I enjoyed today at Cafe Polo. 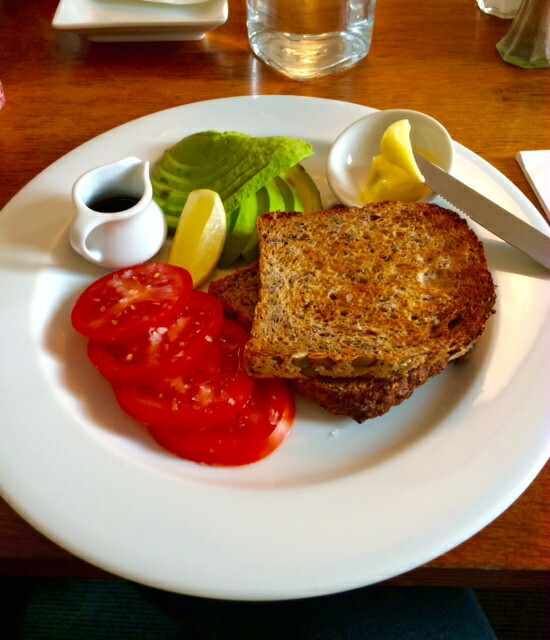 5 grain toasted bread, avocado, vine ripened tomatoes, lemon.